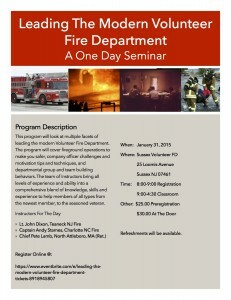 Leading The Modern Volunteer Fire Department – January 31, 2015 Sussex NJ. This program will look at multiple facets of leading the modern Volunteer Fire Department. The program will cover fireground operations to make you safer, company officer challenges and motivation tips and techniques, and departmental group and team building behaviors. The team of Instructors bring all levels of experience and ability into a comprehensive blend of knowledge, skills and experience to help members of all types from the newest member, to the seasoned veteran. Refreshments will be available !